Japanese manga and anime has a bit of an obsession with giant robots controlled by human pilots. These huge humanoid weapons are usually used to defend humanity against other giant machines or otherworldly monsters. As the stories like the Iron Giant and the success of recent films like Pacific Rim show, this appetite for stories involving giant robots is fairly universal. Sylvain Neuvel shares this fascination. Challenged to create a backstory for a toy robot that he built for his son, Neuvel has dug into this tradition to come up with Sleeping Giants. Sleeping Giants starts with a great cold open. Young Rose Franklin, riding a bike on her tenth birthday, falls into a hole and finds herself cradled in the palm of a giant metal hand. The hand is surrounded by panels covered in strange, glowing symbols. Both turn out to be made of a metal alloy that should not exist on Earth. Twelve years late she is Dr Rose Franklin and has been commissioned to examine the hand and try and decipher the symbols that surrounded it. Rose soon learns how to locate other parts of the robot and the race is on to locate, construct and control the whole machine. 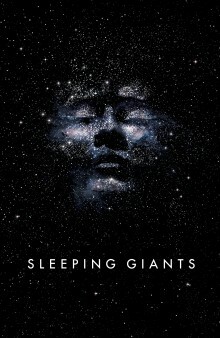 Sleeping Giants is told as a series of interviews with an unnamed narrator which is both a strength and a weakness. The style allows for the discussion and translation of techno jargon in a way that is at least explicable. And this is a very tech-driven tale (at least until it becomes a bit metaphysical). The interviews are numbered and by skipping numbers, Neuvel gives a feeling of a much bigger story. But there are significant limitations to only using this approach. The interviewer needs to get extremely personal at times and his subjects are incredibly open with him in a way that is sometimes hard to believe. And the reason why he is even recording all of these conversations is never really clear. The narrative style means that key action scenes are all narrated not just in past tense but in hindsight – and then I did this and then I did that – which detracts from any build up of tension. Despite shortcomings in the narrative style there is a lot to like here for science fiction fans, and particularly fans of giant robot stories. The robot itself steps straight off the page of a manga comic, complete with a requirement for two internal pilots, and armed with an energy sword and shield. The key characters, while a little sketchy, feel real. And while the geopolitics of the novel are often simplistic and a little naïve, Neuvel manages to convey the idea of a global enterprise. The origin of the robot itself is shoehorned into the plot as a couple of chapters of infodump from a mysterious stranger. However, this backstory gives the whole tale an interesting premise. And a cliffhanger ending sets up for a completely different sequel, one that is likely to involve plenty more giant robot action.